Victor Rigoni, III is a founder of North Shore Capital Group and has been a leader in the financial services industry as a financial advisor since 2000. Over that period of time, he has advised clients in the management of their investments as it relates to their personal and business goals through an independent perspective. Victor is an acknowledged teacher and coach in investment management and enjoys meeting clients where they are and understanding their financial goals by helping them to the next level of financial independence. Victor holds numerous licenses including his Series 7, 63, 66; Life and Health insurance lines. Prior to his years as an independent consultant, he was an investment representative and financial advisor at Edward Jones. 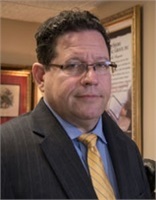 Victor also spent over 20 years in the residential and commercial real estate markets as an agent and broker-owner of a Coldwell Banker office. During that time, Victor served on the Lake County Board of Realtors and managed an office of over 20 agents. His real estate career was marked by many personal and professional successes, including residential development and property management. This deep understanding in both real estate and wealth management has served well in guiding his clients at North Shore Capital Group. Being an active volunteer has always been important to Victor. Over the years Victor has been active in many service clubs including Rotary and Kiwanis, which ultimately led to Victor serving as a Kiwanis Charter Club President in 2003. More notably, Victor was the both the founder and Charter President of North Shore Professionals, the Lake Forest Chapter of Business Networking International, where he is still an active member. Outside of the office Victor is internationally well traveled and enjoys spending quality time with his family and beautiful granddaughter.